You won’t believe how our season ended! So now that we’ve had a few weeks to reflect on our varsity season, all I can say is: wow. In my 16 years of coaching, this year has had one of the most unique challenges our program has faced: how do you take a team where 18 of your 22 wrestlers are freshman and sophomores, get them to buy into the philosophy of working harder than they’ve ever worked before, convince them to put the success of the team ahead of themselves and get them to perform at a very high level in an ever-more-competitive section? Just to make it a little harder, let’s say of those 18 freshmen and sophomores, 14 are first-year members of our team. It was a year that really tested everything we so deeply believe about building a strong team. 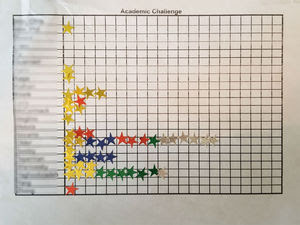 I think the results are something we can all be VERY proud of! As a team we finished 6th in the Section – a pretty incredible feat considering we were the youngest, least experienced team in the entire tournament! We had 7 individual Sectional Placefinishers – and 5 of them are back next year! Our two seniors both placed in the Section for the first time to end their high school careers! Maunil Kothari finished 6th and captain Georgie Guarnieri finished 3rd, despite being seeded 6th, wrestling the best tournament of his life and avenging earlier losses to two of his opponents in the process! We had Edgemont’s 23rd all-time Section Champion – Nick Meglino – who went on to finish in the Top 8 in New York State and is only a junior! Our team GPA during the wrestling season improved for the 3rd straight year! 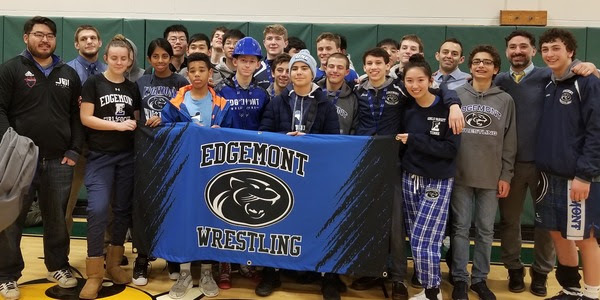 Together with Irvington Wrestling, we raised over $800 for the American Cancer Society in memory of Robert Schwartz – father of our own alum Mike Schwartz ’17! We had maybe the most close-knit team I’ve ever had the privilege of coaching – these guys would do anything to help each other and the team! We had some of the strongest leaders I can remember, constantly setting a positive example and keeping our team focused and on track – most of them will be back next year together with a great group of burgeoning leaders amongst our rookies! It’s really easy to be excited by what the future holds for us. Very clearly, we benefit from a virtuous cycle of great leaders, developing more great leaders, who rise, take the place of those who came before and continue championing our positive culture. Every year we seem to have more wrestlers in our program setting the example of how buy-in to our philosophy and culture can yield tremendous results on the mat – more and more concrete examples of where a focus on the process can take you. Believe it or not, we’ve had at least one wrestler finish in the Top 8 in NY State every year for the past 12 years! This year that wrestler was Nicky Meglino, who’s performance at the State Championships is certainly worth highlighting. 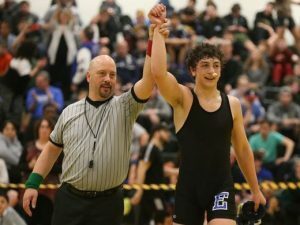 Despite entering the tournament for the first time and as an unseeded wrestlers, and despite all the pressure that can come along with that, Nicky wrestled his way into the quarterfinals. In the quarters, he faced #1-seeded Ross McFarland of Phoenix. McFarland won the bout, which wasn’t Nicky’s best. That knocked him down into the wrestle backs – one more loss and he’s eliminated from the tournament. That put Nicky in one last match on the Friday night of the tournament. The match where if you win, you’re guaranteed a Top 8 finish and make it to the second day of the tournament, making truly one of NY’s elite wrestlers. In a lot of ways it’s a really tough round to wrestle in: you’re tired, you’re beat up, you’ve already wrestled several matches, you’ve been at the arena all day, they make you wait around until 8:30 at night with nothing but time to reflect on your prior loss and the high-stakes match ahead of you. It’s not an enviable position to be in. That was the only conversation we had until it was time to warm up for his match about 30 minutes out. When it came time, we discussed the scouting report and game plan for his next opponent and put him through his pre-match warm-up. So what happened next? Nicky took the mat and wrestled the best match of his life. Nick won an exciting 8-3 decision over Grady Alpert from Section IV to finish in the Top 8 in New York State! It’s not about the accomplishment, though. It’s easy for us to celebrate Nicky’s great performance, but, as anyone involved with our program knows, it’s not the accomplishment that’s really special. Achievements and results are just a marker of what’s really important: the constant focus on improvement, striving to reach our potential, being the best we can be and refusing to settle for mediocrity when we’re capable of so much more. That’s a great way to sum up Nicky’s season. As his coach, I’ll tell you I think the number one thing that’s contributed to his success has been his singular focus on the process of getting better every day. It shows. Two years ago Nick had a losing record. I think he had maybe 10 wins. Last year, he took 4th in the Section, certainly an improvement, but a very far cry from where he is now. Flash forward to 2018: to Nick’s 33-win season, his Shoreline Tournament and Sectional titles and his Top 8 finish in NY State. His progress from year to year is both consistent and remarkable! Nick is such a great example of the wrestlers in our program right now: a group of kids who really go against the grain of today’s culture. These are kids who no longer depend on instant gratification for their motivation. Kids who come into practice each day, push themselves to be better than the day before and hold each other accountable to a very high standard. Kids who step on the mat to compete and courageously put themselves out there time after time, actually embracing failure as a critical part of the path to greatness. Looking at the ever-evolving world around us, I think we can all acknowledge just how rare and how special this is. It is not the norm. If you couldn’t tell, I’m so proud of our student athletes! The true satisfaction comes from watching these qualities develop in the crucible of wrestling and then watching our kids put these lessons to work for them in the rest of their lives. third year in a row by applying these principles! Watching our kids embrace challenge, face adversity head-on and rise to the occasion in their academics, their relationships and other sports and extracurriculars is awesome to be a part of. Watching our alumni move on to achieve such great things in their lives is amazing! We teach our kids to set big goals, but more importantly to weather the storm of failure, adversity and setbacks that are inherent in the pursuit of any lofty endeavor. I constantly get questions from alumni, parents, coaches, teachers and administrators about how we do what we do. The short answer is support and teamwork. Over the years, our program has evolved from a “wrestling team” to an all-encompassing program hoping to teach kids a blueprint for success in life. This hasn’t happened in by accident. We have a family of caring, committed coaches, alumni and parents who have all played such an important role in making this program what it is. It’s sometimes overwhelming to look at all the people who have had a hand in this over the years. As the head coach, people often over estimate the amount of credit I deserve. The reality is that this is a family because everyone’s role is significant and necessary. Our kids bust their butts everyday to accomplish great things. Our coaches work tirelessly, including many hours outside of practice and competition, to build an optimal experience for our wrestlers. Our parents offer never-ending support of their kids and our program with all that’s asked of them. Our alumni are a constant source of support, motivation and inspiration. A coaching mentor of mine once told me you can gauge the strength of any athletic program by the involvement of its families and alumni. The longer I coach, the more I see that to be absolutely true. What I’ve come to realize, though, is that kind of support isn’t so much a result of our program’s strength – it’s the reason for our strength. It’s our alumni and their families, and our supporters and fans that are really the x-factor. In fact, your support is the the single greatest demonstration we’re able to give our wrestlers that they compete for something bigger than themselves. Your support is the motivation that pushes us past the tipping point. You guys are literally the power that drives the ship. I can’t tell you the difference it makes for our guys having alumni show up at practices or matches. Seeing parents of former wrestler in the stands supporting our team. Having conversations about the future of our program at our Candlelight Inn BBQ each spring. Receiving calls, texts, emails and direct messages asking about our team’s performance or offering support. The monetary gifts that allows us to keep doing what we do, far beyond what our school budget can afford. As a coaching staff, we intentionally share all of these interactions with our wrestlers, because, collectively, it’s a game-changer. Every fan in a seat, every conversation, every dollar in gifts to the program is literally the physical manifestation for our wrestlers that they’re on the right path; that no matter how hard it gets, the struggle is worth it; that you, who have come before, recognize the value of this sport and this program and take pride in helping others achieve the same goals. I was recently asked an interesting question by one of our alumni from the 80’s. He asked me: when did we go from being a wrestling team to a wrestling family? I stopped and thought about it. I’d never been asked that before. The answer is this: we became a wrestling family the moment we all realized that they only way for us to really accomplish our ultimate goal of “Building Champions on the mat and in life” effectively is doing it all together – wrestlers, coaches, parents, alumni and supporters. That’s why I’m proud, today, to kick off Edgemont Wrestling Club’s Annual Giving Campaign for the next 30 days. Our goal: 60 donors. Just like everything else in our program, we’ll do it together. My only request is this: Please take a look at why your gift to our program is so important right now (and how you can support our program). As always, thanks for your support and talk to you soon!